I know cars don’t start. Boyfriends can be jerks. Kids can be sick. People can cut us off. My team could be playing while I have to be at work. Life can totally get in the way of well … Life. But, as far as our residents are concerned, they cannot have any idea, none whatsoever, that we are not 100% focused on their happiness, treatment, and recovery. Does this mean we shouldn’t share our lives with our residents? Yes. It means we shouldn’t place our worries and concerns on residents who have serious worries and concerns of their owns. Like in the commercial above, if we’re having a bad day or we wished we weren’t at work, we cannot let our resident have a clue. Like the girlfriend in the commercial, she has to know that her boyfriend is sincerely devoted to her. Don’t get me wrong. I’m not advocating deception. I’m advocating a customer satisfaction truth that we are always on stage when we are around our residents and patients. The ‘floor’ is our stage. And, no matter how bad your life is today or what great reasons you have to not smile, when you’re on the floor, you’re on stage and, in order to give the resident the best experience and best care, they need to see us at our best. When my daughter was 5 years old we took her to Disneyland for the first time. Like most 5 year old girls, she was totally ‘over’ Mickey Mouse. Please. She was there for one reason and one reason alone … to mix it up with her favorite princesses. It’s all about the Disney Princesses. Clothes, plates, utensils, tiaras, videos, etc. It’s a racket. We discovered that Pocahontas (yes, she’s an official Disney Princess. Don’t fight it) was hanging out over by the Pirates of the Caribbean. We clasped hands and booked it! We were dodging and weaving through the mass of people … and, there she was. We froze. Oh my goodness. She squeezed my hand. She looked up at me. She gradually made it to the line and expectantly stared forward. Finally, her turn. The Indian Princess greeted her, put her arm around her (and my son who was pretty oblivious to the whole coming of age moment for his bigger sister) and posed for the picture. The princess asked my daughter’s name and thanked her for meeting her. My daughter rushed to me and I showed her the picture. We walked away holding hands and I knew what she was thinking … ‘my dad is the best dad in the whole world!’ Ok, maybe not. 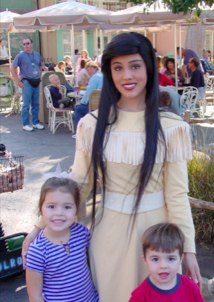 She was probably marveling at her luck to meet the real Pocahontas. Can you imagine if Pocahontas acted like some of our staff? Do you see the comparison? How many times have our residents overheard something similar? I’ll share a secret with you now … as long as you don’t share it with the wrong people (like my little girl). Pocahontas is not real. She’s an employee of Disneyland. Each of us is “on stage.” Just as Pocahontas was/is. While on stage, we have to act a certain way. The little girl would not put up with that. We are each Pocahontas for our residents. We must act, speak, and look a certain way while on the floor/stage. It’s up to us to DEFINE what is expected in terms of our actions, words, and appearance. If you don’t define it how can you achieve it? Of course, on those bad days that we all have, we have to “act” a little more than on the good days. (Here’s a classic video I use to demonstrate this). Nevertheless, we’ve got to make each resident/visitor interaction count with EVERYONE.